Before the internet, the US Navy and several universities were sources of climatic marine weather data that could be traced directly back to Matthew Fontaine Maury in the mid 1800s. It was his original idea to study old logbooks to extract and record weather and sea state observations and compile them into what evolved into modern Pilot Charts and now COGOW, which replaces even the Pilot Charts for climatic wind data. This work was extended in tropical waters worldwide in the 1980s by James C. Sadler at the University of Hawaii where he did the same thing with hundreds of thousands of ship observations from the mid 1800s to mid 1980s. Samples of Sadler’s Tropical Atlas for July are shown below. They remain an interesting depiction of average wind flow each month that could help in the planning of ocean voyages across the tropics—or at least help us understand why the traditional routes evolved as they have. Volume 2 covers twelve months for the tropical and sub-tropical Pacific Ocean. An electronic copy of Vol. 2 is available at the University of Hawaii meteorology web site at https://www.soest.hawaii.edu/Library/Sadler_et_al.html, although you will not find any link to this location from their web site. Volume 1 covers Atlantic and Indian Oceans, available in some libraries. These plots are easier to use than Pilot Charts for seeing obvious sailing routes. They can be useful to investigating winning routes in ocean races and historic sailing routes of discovery. They would also indicate likely drift routes across the ocean. LuckGrib is one viewer that can show true streamlines (example below). OpenCPN has an option called "particle map" that simulates them on some level. Streamlines are a nice way to note forecasted convergence and divergence zones. Not many viewers show true streamlines as it is a difficult computation. 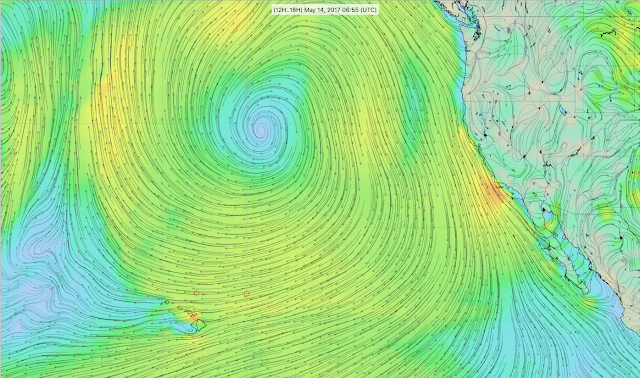 A streamline display of 10m winds from GFS shown in LuckGrib. Capitalization does not matter; you can use /ngapubs. The actual link you see seems to depend on how you got there. It is marked as a secure page (https), but it is not secure. This is the strange situation we see with many NGA and Navy pages. LATEST and BEST update... I think. will do the job. Don't use www, or anything else. Just type that in the url and hit enter. Then select Publications link on the left. Lets look into decision making as it might apply to weather routing. I have a forecast that says the wind is going to veer by 30º overnight. Suppose if I jibe now and the wind does veer 30º by tomorrow morning I will gain. But If I jibe now and the wind does not veer 30º by tomorrow morning then i will lose. What do I need to know to decide if I should jibe? We need numbers, or estimates of numbers, on all three factors involved. P = probability of the wind veering as forecasted. Risk = how much you lose (in the same units) if you jibe and the wind does not shift as forecasted. 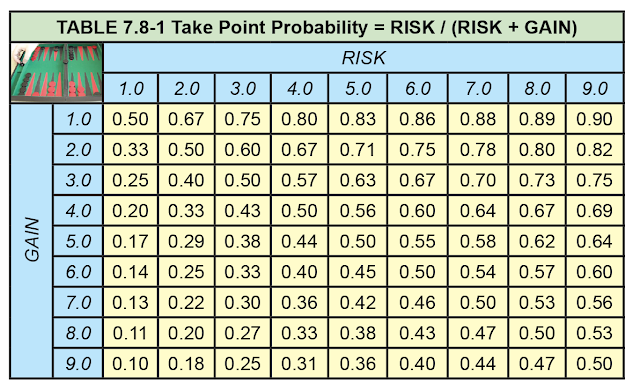 We can figure the Risk and Gain numbers from our polars. We are left with computing a take point probability P for the forecast. In other words, we calculate how big does P have to be so that the chances of gaining are higher than the chances of losing. P x Gain ≥ (1-P) x Risk. In words, the probability of the veer (P) times the Gain from the veer must be greater than the probability of no veer (1-P) times the Risk. If the probability of yes is 70% or 0.7, then the probability of no has to be 30% or 0.3.
which is our working guideline, and we can make a table to solve it by inspection. The units can be anything, miles, minutes, hours. Suppose you figure you would gain about 4 mi if the wind veers, but you would lose about 1 mi on the slightly slower jibe if it did not veer. Thus P = 1/5 = 20%. The forecast only has to be right 20% of the time and you come out ahead. A clear call to go for it. On the other hand, you face a more ambitious maneuver to catch up. You figure you will gain 2 mi but would lose 8 mi if there is no veer. Then you have P = 8/10 = 80%. The forecast has to have an 80% chance of being right, which makes you study the weather maps very carefully, look for ship reports, read the Forecast Discussions, etc. Do what ever you can to add confidence to the forecast. If the winds aloft were changing rapidly, and the present surface analysis did not match what you actually saw in pressure and wind, then you probably can't believe this is 80% likely, and have to pass, or maybe try 3 hr and then jibe back to wait another 3 hr to get the next map. In other words, do half of what you want. Needless to say, one can take that formula off of the boat and think about it in various social or economic settings. The decoration on the table is in honor of our lunch and break table at work, where it rules about 12.5% of our working day.